The attention of the Nigerian Army has been drawn to an online report by SAHARA REPORTERS ON 28 APRIL 2016 in which the Islamic Movement in Nigeria alleged that the Nigerian Army is planning to steal bodies from mass grave in Zaria. It further, stressed that a contingent of soldiers have been deployed to keep guard at the site of the mass grave in an effort to prevent the uncovering of the hundreds of bodies buried there. It is simply a figment of their jaundiced imagination and a campaign of calumny againt the Army. 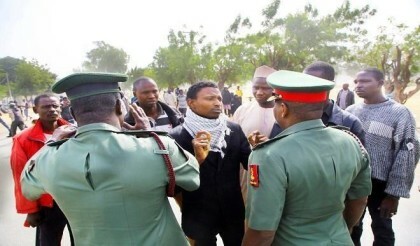 The Army strongly and categorically reject the IMN’s unfounded n spurious allegation. It is simply a concoction of lies and deliberate effort by the IMN to portray the the Nigerian Army’s image negatively. The Nigerian Army will like to make it abundantly clear that, it has never contemplated such act at anytime. It’s of no relevance whatsoever. we are focused on discharging our constitutional duty as a professional military force. We expect any responsible media to double check such weighty allegations before going to press. Nigeria’s national security and interest must never be toyed with. The Nigerian Army as a law abiding entity had already stated its facts regarding the December 12-14 incident in Zaria before the Justice Mohammed Lawal Garba led Judicial Commission of Inquiry. For the avoidance of doubt, the commission had on Wednesday 27th April, 2016 visited all the sites of the incident in Zaria including the grave site in Kaduna. It was widely aired. It is not the duty of the Army to guard any public grave site other than our own designated military cemeteries. It appears that the IMN’s desire is to whip up public sympathy not minding their crimes over several years against the people of Zaria as testified by the parties at the just concluded sitting of the commission. The Islamic Movement in Nigeria failed to state her facts or opinion if any as regards the incident of December 12th and 14th 2015 before the judicial commission of inquiry. While we await the report of the judicial commission, we would like to call on the general public to disregard this unfounded claim. Nigerian Army will continue to safeguard the lives and property of all citizens in every part of our great country. That is our mission.